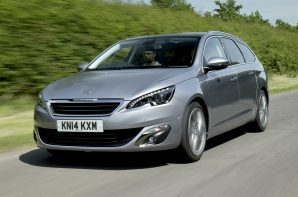 Adding weight to a car is never a good starting point as it dents fuel efficiency and handling, however thanks to the crash diet Peugeot’s engineers put the 308 through it is well placed to cope with an estate makeover. The final result is a sub 1,300 kg kerb weight which many hatchbacks would be pleased with. Having said that, dropping an extra 110 kg into the mix has to have some effect and it can be seen in a slight increase in the 0-62 mph time and a slight increase in thirst. However going by our experience of the same engine in the hatch, as long as you don’t use all the boot space on every trip 70+ mpg is easily achievable which is an excellent result.